TO WATCH A RECORDING OF THE SERVICE, PLEASE CLICK ON THIS LINK. In my years of ministry, which include three years as a youth leader, seminary internships, and 13+ years of ordained service, I count Ashley Parsons one of the finest of God's servants called to youth ministry. 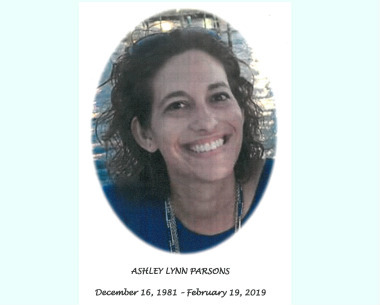 Following up on events like Vacation Bible School and various seasonal festivals, I often proclaimed to session and to others my admiration of Ashley who "could get these kids to do almost anything with her enthusiasm, her laughter, and her obvious love of Christ." Until she began to be, understandably, overcome by the truth and progression of the cancer, she was always a spark of life in the office, a team-player constantly willing to engage in transformation, experimentation and learning; she always believed that as long as God is still giving us breath, "God is not done with us." Ashley entered the Church Triumphant earlier this week, welcomed by the heavenly host to join in singing praises to the Lord. Her suffering and sadness has been turned to joy. She was cared and prayed for over the years by many members of the Body of Christ, including of course her adoring husband Ryan, her loving children Ryan and Logan, her faithful parents Charlie and Debbie, and her always hopeful sister Mallory. Our prayers continue for all those who became "Ashley's Army. From Romans: "If we live we live to the Lord, and if we die we die to the Lord. Therefore, whether we live or whether we die, we belong to the Lord." The joy of Gospel of Jesus Christ comes finally from the assurance that God has reconciled us to himself through Christ the Lord. Though today we have tears, we rejoice with the Saints of Light that the power and sting of death is destroyed because God has given us love that will never let go.